Anyone using an OAG on a C11" with a Moonlite Focuser. I'm only interested in guiding at the moment and not producing color images. So, I'm looking to see a setup with an OAG on a C11" with my Moonlite focuser. I've seen setups with a filter wheel and built-in OAG but not an OAG alone. It would be good to know what OAG has worked well on this SCT inline with the Moonlite focuser. I'm not sure if the Celestron Off-Axis Guider OAG would work. Edited by Umasscrew39, 21 January 2019 - 08:18 PM. It works for me. I originally used a ZWO OAG but wanted threaded connections on both sides (the ZWO is only threaded on one side). I purchased a QHY OAG-M and love it - one of my favorite astro purchases. I'm looking to buy another for my second rig. It has a non-rotating helical focuser and threaded connections on both sides. The fit is tight with the Moonlite but it works great. Edited by chadrian84, 22 January 2019 - 04:02 PM. Also note the size difference in the optical path between the mirror and guidecam. 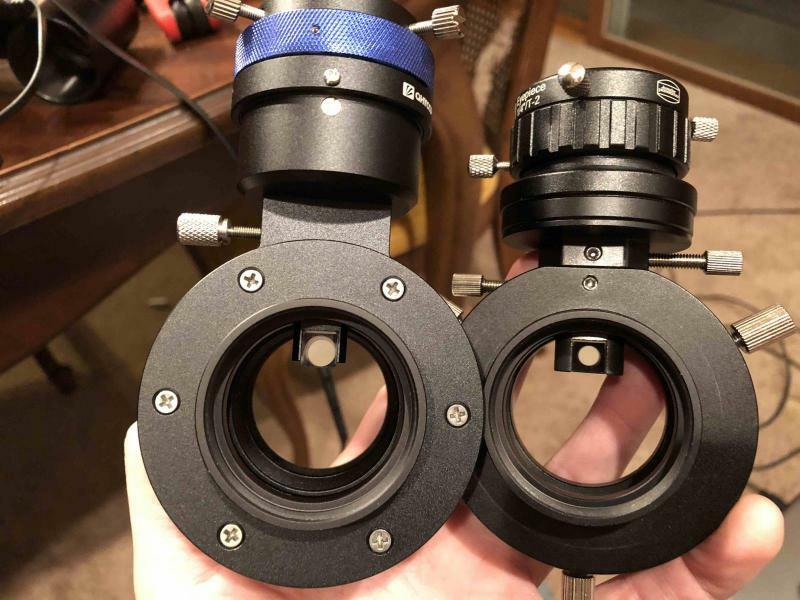 The QHY is more than double the area of the ZWO - important at long focal lengths. The ZWO in this picture has a Baader helical focuser attached to it -- which I don't recommend because it rotates. Thank you- this looks very promising. Looks like you got the medium version. I'll check it out further. One more question. With your setup (camera, filter wheel, OAG, moonlite focuser), any issue with exceeding the 146mm back focus required from the baffle lock nut to the camera sensor? No problems. Backfocus with the reducer is the same as without... 146mm from the Male thread tip end(camera side) of the reducer to sensor. The moonlite threads over that tip by 10mm, so I just measure 156mm from the scope side of the moonlite to the sensor. 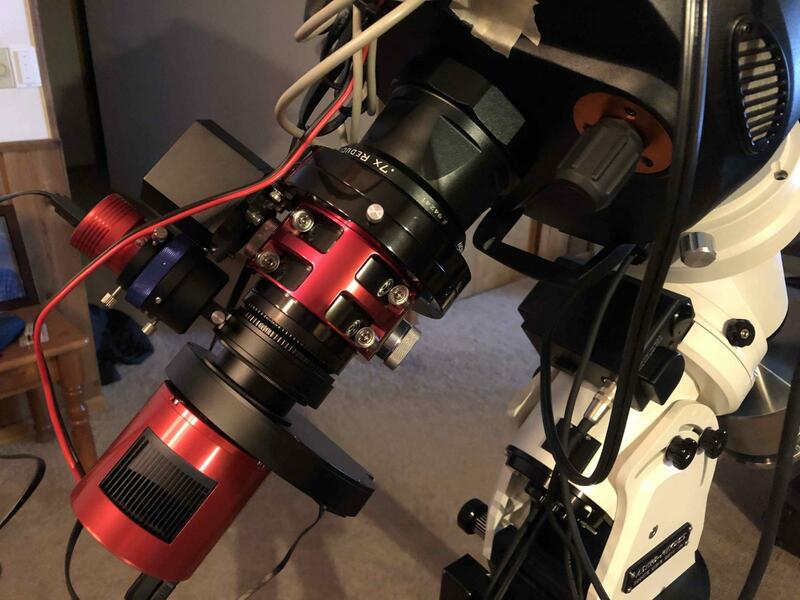 Well- I decided on a little different setup - with my SX Trius 814C, I added the SX mini-filter wheel with the integrated OAG attached to the Moonlite focuser which puts me just about at 146mm. No spacer added and no reducer. This is a totally new setup for me and I just got SGP. So, I have a lot of new stuff to learn going from doing EAA to trying AP. I still need to do the final step with the Moonlite on an image but adjusting focus with the primary mirror focuser before locking it down to use the Moonlite only. It looks like many use the Celestron 0.7x reducer vs. f/10. It would make things easier for me to start given I would have a wider FOV to start. Is it worth the cost? I'm not aware of other reducers for the C11 other than the Optec Lepus reducer which cannot be attached to the Moonlite as far as I know and the hyperstar. This might be my one regret with the Moonlite focuser as I cannot use my hyperstar unless I use the primary mirror focuser. Images with the hyperstar (f/2) on the C11 are really nice.